We are still discussing whether we should have gone for the ‘Plain’ Arch. But you can see this alternative in Terry’s diagram. Sorry we could not put up another handmade Arch. 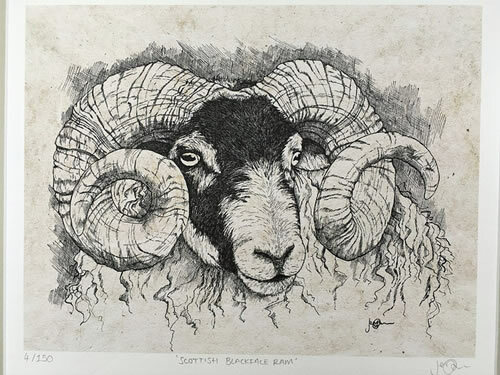 Terry’s sketches give the idea though. The hand crafted trellised sides are the same for both designs. 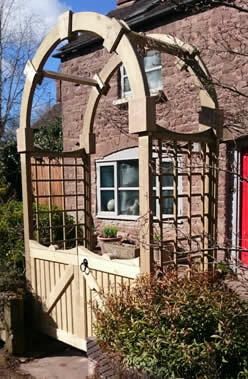 Kind customer's Gemma and Marcus kindly sent in this photo of their 'Plain' arch. “Gated Arch”, is that the best name you can come up with - a “Gated Arch” - yes I can hear you, smugly I suspect, saying it now. Well O.K , you think of a better name. It says just what it is, an arch with a gate. 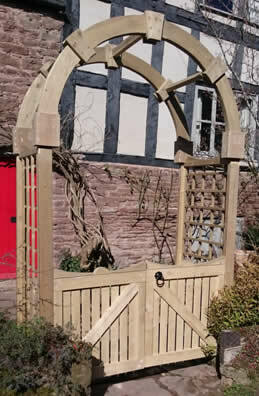 Or rather, a gated arch that is completely handmade to your dimensions, and to your choice of design. So, to put it another way, it is Gated Arch tailor made especially for you. 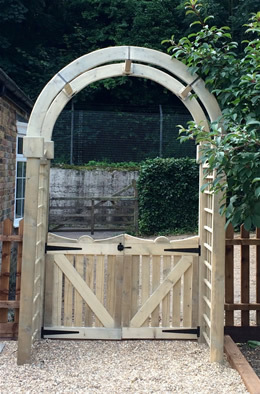 Lots of people kept asking if we could do an arch with a gate. So I asked Terry, who makes our Adirondack Chairs and Raised Beds and things “Why not” ? No reason at all, he said, and hand crafted us the most solid arch, with a gate I have ever seen ! Incidentally our hand made arches come fully treated with our Lifetime Wood Treatment. The alternative Arch design, getting very technical, is a plain Arch without the knobbly bits. The height and depth of trellis dimensions are the same for both Arches, but please let me know whether you are going to anchor your Arch by using brackets to screw into concrete, or going to sink post uprights into the ground. 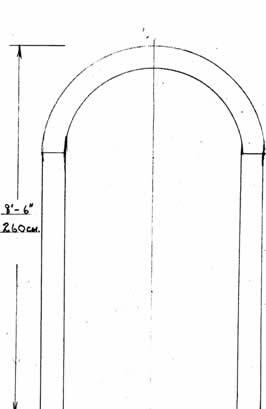 Just please stipulate your own width dimension, any size up to 2 metres, and we will tailor make your Garden Arch just for you. When you measure please measure total width, including uprights, and not just the gate size. Your Arch will come in really easily assembled kit form. Side pieces are complete, while the arch pieces easily slot together then screwed in place and slotted on to sides. Then just screw hinges onto the gates, and screw into uprights at the height you prefer. It took just two hours to assemble and fit ours. All of the hinges, screws, latch and bolts needed are included. The only items you would need to buy are the fixing plates if you chose to fix to concrete or brick. As your Arch and Gates will be especially handcrafted for you though, they may take up to 14 days to make. Then the courier will moan and groan a lot about the size and weight of your Arch, and then take two working days to deliver. 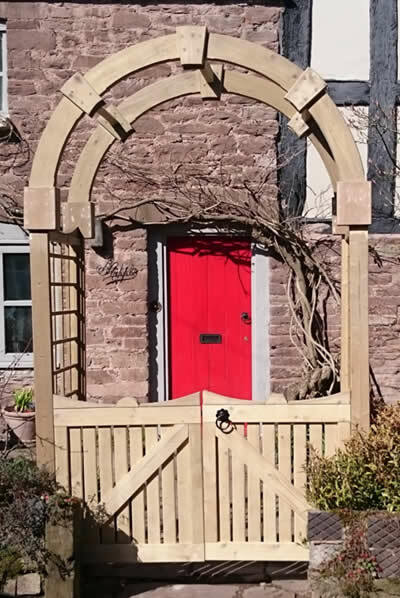 You will then have your own unique handmade Gated Arch which will last for years...... and years...... and years ! If you have questions please just give Joe or I a call – 01568 611729.